Although most of the dangers from unregulated and indiscriminate use of pesticides were brought into focus as early as in the year 1958 when the Government of India appointed a Commission of enquiry to suggest Inter-alia remedial measures following a number of deaths in Kerela and Madras (Tamil Nadu) by poisoning through the consumption of imported wheat contaminated by pesticide accidentally which was shipped together with food grains. The whole question of pesticide use and legislation was studied in 1964-67 by an Expert Committee of Indian Council of Agricultural Research headed by Prof. M.S. Thacker. Based on the recommendations of the Expert Committee a comprehensive Insecticides Act was passed in 1968 to regulate the import, manufacture, sale, transport, distribution and use of insecticides with a view to prevent risks to human beings and animals and for other matters connected therewith. The enforcement of Act was tranferred to the Ministry of Agriculture in the year 1970 by the Ministry of Health and family Planning. The department of Agriculture of this Ministry took immediate steps to frame the Rules and constituted Central insecticides Board and Registration committee. The states were simultaneously advised to appoint all functionaries mentioned in the Act. After the stage was fully set, all the provisions of the Insecticides Act was brought into force with effect from 1st August, 1971. In the Act and the Rules framed there under, there is compulsory registration of the pesticides at the Central level and licence for their manufacture, formulation and sale are dealt with at the State level. With the enforcement of the Insecticides Act in the country pesticides of very high quality are made available to the farmers and general public for house-hold use, for protecting the agricultural crops from the ravages of their pests, humans from diseases and nuisance caused by public health pests and the health hazards involved in their use have been minimised to a great extent. For the effective enforcement of the Insecticides Act, the two bodies have been constituted at the Central level viz. 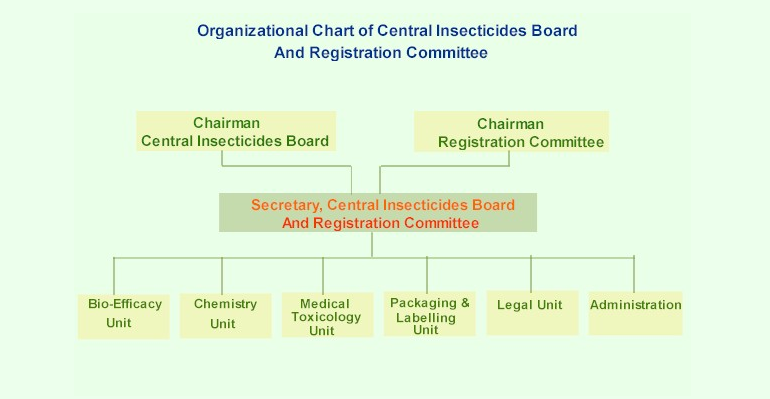 Central Insecticides Board and Registration Committee.